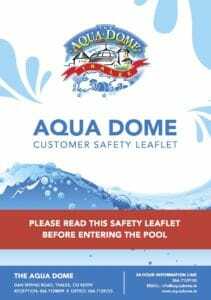 The Aqua Domes main objective is to ensure all customers have a safe, enjoyable and memorable visit to the Aqua Dome. For this reason customer safety is a priority. If this is your first visit and especially if you are supervising children, please read this safety notice carefully. If you are in doubt about anything, ask a member of staff who will be glad to assist you. 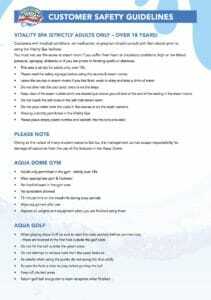 Please read the customer safety leaflet and watch the safety DVD at reception prior to entering the pool area. Familarise yourself with the pool depths paying particular attention to the deepest parts especially in the wave area. All children under 8 years of age must be accompanied by a responsible adult at all times. Ratio: 1 adult per 2 children under 8 years. 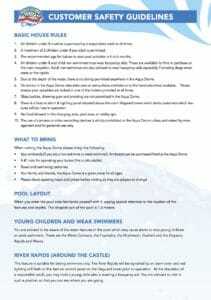 All children under 8 years of age or under 1.3 meters in height must wear armbands (see the safety height stand at reception) For those who are good swimmers and do not require armbands a waiver can be signed by a responsible accompanying adult. All weak or non-swimmers are advised to wear armbands. Arm bands can be hired at reception for €2.50 or purchased for €6. There is no running, no jumping or diving allowed. A warning siren comes before the Waves, Lazy River, River Rapids and Outdoor Falling Rapids come on. Armbands are advised for weak or non-swimmers when these features are in operation. Stay on the left side of the Lazy River to avoid being swept into the deep end when the currents are on. Glass bottles, chewing gum, smoking and alcohol are not allowed in the Aqua Dome. Ensure your valuables are locked into your locker at all times. You need a €1 coin to operate the locker. 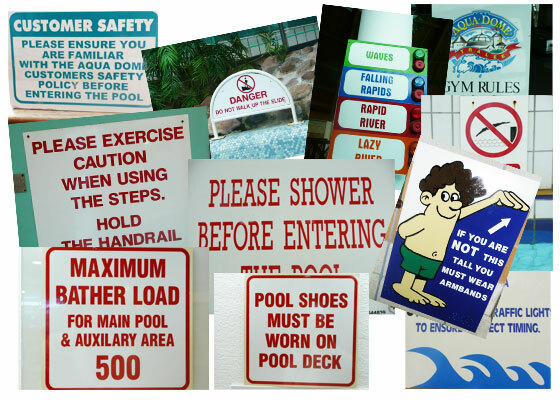 Obtain permission from management prior to operating a camera or camcorder in the pool area. Swimming hats are not compulsory. Mermaid outfits and fins are banned from use in the pool due to safety concerns. 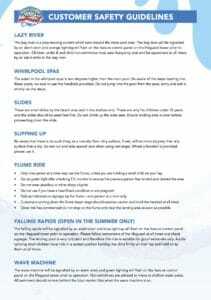 For those with young children please be aware the water jets in the pool may cause alarm if they are hit by them. These jets are in the Sprays at both sides of the main pool area, the Mushroom, Gushers and Gysers. This is suitable for strong swimmers only. A responsible adult may hold a young child who is wearing armbands or a buoyancy aid. You are advised to ride in such a position so that you can see where you are going. Be aware of the steps leading into the whirlpool spa pools. Use the handrails provided. Do not jump into the pool from the whirlpool spa pools. Entry and exit is strictly via the steps. The water in the whirlpool spas is 2°c higher than the main pool. These slides are located in the main pool area. These slides are for children under 12 years. Ride the slides feet first. Do not walk up the slides. Be aware that there is no such thing as a non-slip floor. Any surface that is wet will be more slippery that any surface that is dry. Do not run and take special care when walking on wet steps. Use the handrails provided. Ride the slide one at a time. Go on the Green light only after you have observed the person in front of you exit the bottom of the flume, on the TV monitor. Observe the signage at the top of the flume tower. Use the handrails provided and exercise caution when coming down the flume tower steps. Do not wear jewellery or sharp objects. Do not ride the flume if you are pregnant or have a heart condition. Immediately clear the aqua catch area once landed. This ride is suitable for good swimmers only. Ride the slide one at a time and feet first. Read the safety signage and follow instructions. Exit the landing area immediately upon landing. Non-swimmers are advised to stay in the shallow areas while the waves are on. All swimmers should remain behind the blue marker tiles when the waves are on. This is for 18 years and older. Read the safety signage on display. Do not use the Steam Room or Saunas if you are pregnant, have a medical condition, heart condition, feel faint, weak or dizzy. Keep clear of the steam outlet which is just above ground level on the right hand side as you enter. Do not dive into the cool pool. Use the steps and handrails provided. Shaving is not allowed in the sauna or steam room. Always wear proper training shoes and appropriate clothing. Seek advice from a staff member on equipment use. Food is not to be consumed in the gym. Adult admission includes full use of the gym. Special permission is required if you are under 18 years. Please note that owing to the nature of many costume fabrics, the management cannot accept responsibility for damage to costumes from the use of the features in the Aqua Dome. 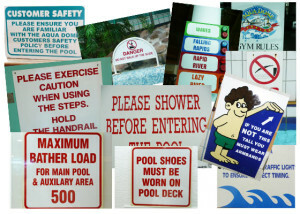 Please review the Customer Safety Leaflet prior to entering the pool!